Auto! The word itself paints the canvas in our minds with multiple experiences that we have had in the past while travelling in a public conveyance of Auto-rickshaw, popularly addressed as Auto in our city of Patna. Travelling in auto-rickshaw can be an occasional experience for few while for others it may be their daily routine as it is the main mode of public transport. Commuting with it can be fun for some and it can be a daily monotonous schedule for others. The experience one has varies on number of things related to the travel of the person. 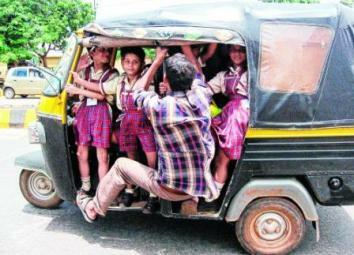 It varies from the frequency, route of auto, co-passengers and the maintenance of the entity (auto-rickshaw) as well. To be specific about Patna, travelling in the three-wheeler public transport can be different experience for different individuals, not to mention those rough jerks. The first and foremost thing that auto-rickshaw of the town offer is the route availability that it has. The auto-rickshaws in Patna cover the entire stretch of Patna right from Patna City or Shaguna More or Danapur being East and West ends of the city respectively to two central points called Gandhi Maidan and Patna Junction. It also has routes covering the entire city linked to central points like Boring Road, Nala Road, Karbighaiya , Mithapur , Hanuman Nagar, Agam Kuan, Chitkohra, GPO, Anisabad, Bypass and others. The fare ranges from a minimum of Rupees 5 to a maximum depends on distance on any route on sharing basis. It serves as a lifeline of the city when it comes to travelling by public transport, in terms of being pocket friendly and the number of frequencies it has. Travelling by auto-rickshaw has its pros as well as cons both. The best part of the travelling in it in Patna is the flexibility of boarding and de-boarding at any point which one likes (Ignoring the gridlocks). It is economical and the pool of passengers sharing auto-rickshaws serves as environment friendly commodity saving the fuel. One need not worry about the parking space and the best part is that it is driven by the driver of the auto-rickshaw which allows an individual to focus on other stuffs. The travel has some cons too. The sharing system can offer some times one of the most unhygienic and stinky experiences in hot summer with dust and humid adding on to the occurrence at times or it can give chills and send shivers down ones spine in chilly winters, when that breeze passes through. It is a bit unsafe if travelling too late or alone especially for girls as any public transport system offers a scope of voyeurism and molestation so one needs to be careful of their surroundings. Moreover, their routes are fixed so no diversion is allowed unless moving on a reserved basis but that turns out to be an expensive affair like a Taxi. Talking on technical terms and administration, the auto-rickshaws of the state have their own association named ‘The Bihar State Auto-rickshaw Chalak Sangh’ with zone wise Sanghs (Unions as well) which monitors the price and other issues related to the Auto-rickshaw driver fraternity. The last price revision was done in September 2018 which saw a hike of Rupees 2 in two routes of Patna. Overall, travelling in auto-rickshaw especially today in Patna with constructions and wreckages on roads all around; can be a fun and add experiences depending on perspectives of the traveler. Good luck with all those jolts and hullabaloos to any first timer.